After writing an outstanding article, every blogger wants to receive many visits, comments and share. You desire also the appreciation from your readers or some mentions from popular people in your niche. In a few words, you want to get over yourself and write the most popular article of your blog. But sometimes achieving this mission is not just so easy. 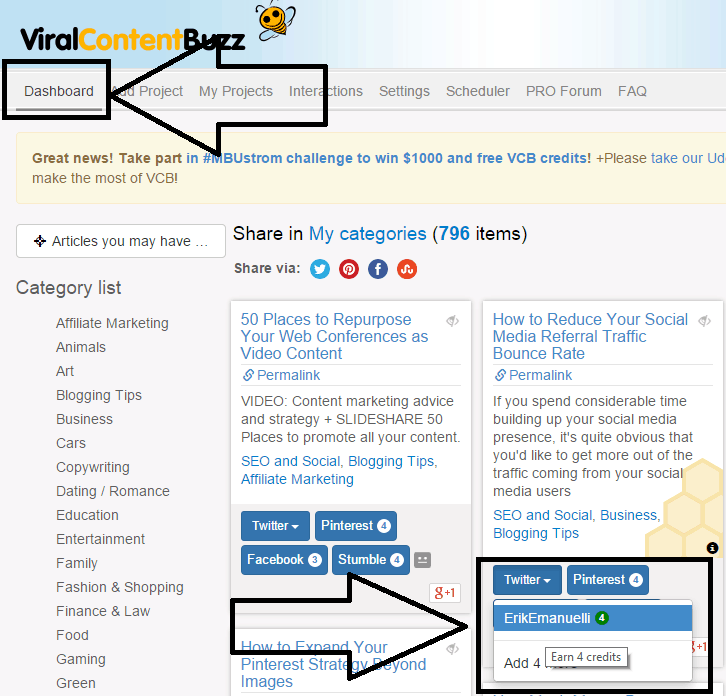 In this post, I introduce you ViralContentBee, a great website you can use as an effective tool to get more traffic to your website, while increasing your authority online. The first and most important thing : ViralContentBee is free. So be sure to create an account, by using your email, your Twitter or your Facebook credentials. Complete your profile, adding your first and last name, and your email. Select the groups of interest, by choosing among different categories (in this way, you will get just projects to share belonging to your interests in your dashboard). I’ve chosen affiliate marketing, copywriting, blogging tips, SEO and social. Then set your Twitter, Facebook and StumbleUpon details. Before creating your first project, you need some credits. You can earn them, by sharing other users content. In your dashboard, you will see all the projects available to share. You may want to visit the links of the stories and start sharing the ones you like. You will receive a specific amount of credits, depending on your social media account “popularity”. For example with Twitter profile, I earn 4 credits each time I share a new project (I’ve around 25k followers). Don’t worry about the quality of the content available for sharing, it’s manually reviewed by ViralContentBee staff. The same should be considered before submitting your posts. After having collected a good amount of credits, you can create your first project (be sure to submit just your best articles – you may want to check the site quality guidelines here). You want to include the URL of your article, adding its title and a little description. Select the most appropriate category, and then assign a budget to your project (this will be the amount of credits you will use for promoting your post). Finally, choose which social media network you want your content to be shared on : Facebook, Twitter, Pinterest and StumbleUpon. And you want to be sure people will mention you via Twitter, by ticking the “Retweet Me” option. You are now ready to click the “submit” button, to get your project placed in moderation queue. After a ViralContentBee moderator will approve it, other users will see your article for sharing. You can check your stories by visiting “My Projects” in your menu. You can manage all your items here. If you have enough credits, you can revive old projects. The menu you see in the image above, lets you edit your project, add more credits, stop or delete it, export to CSV, move to a folder or check the sharing statistics. An interesting feature of ViralContentBee is the “interactions”. Basically the system tracks each share of your project and lets you visit the corresponding URL. You can follow the promoter of your content on the social media network used, and you can thank him publicly on Twitter, for example. In this way, you can grow your network, interacting with people who shared your content (many of them are influential people). PRO users will get access to the PRO forum. – the option to submit projects by RSS. You can become a PRO by subscribing at this page. You may want to take a look at the ViralContentBee official video. Are You Ready to Watch Your Posts Go Viral? After having understood how ViralContentBee works and submitted your projects, you can enjoy the results. As per different case studies, your traffic will increase up to 200%, by having your articles shared by social media influencers. Your social media authority will improve, due to mentions and shares by people within your niche. In this way, you can also build more following! Finally, it’s an easy way to always get fresh and good content to give to your audience. I hope this article will guide trough ViralContentBee and lets you get the most out of it. I use it for sharing my most important articles, and I ensure you it really works. Have you ever used ViralContentBee? ViralContentBuzz has just quality content to share, with good users, some of them influential. It’s relevant traffic and focused mentions. I appreciate your visit here. Great article and thanks for writing. I heard about this tool like for ages but yet to really get my hands on it. I am thinking I got to try it out. By the way, love the images man! It’s awesome and keep it up! How have you been by the way? Hope you had a great weekend! I’ve used ViralContentBuzz daily time ago, then kinda forgot it for a while. Now I’m again into it. I love the quality of the content there and the influencers sharing my posts. I’m doing great, at this time, Reginald. Online business is increasing, as well as my contacts and connections. Hey Erik, thanks so much for the great review! Great gift to the founders for the holidays! 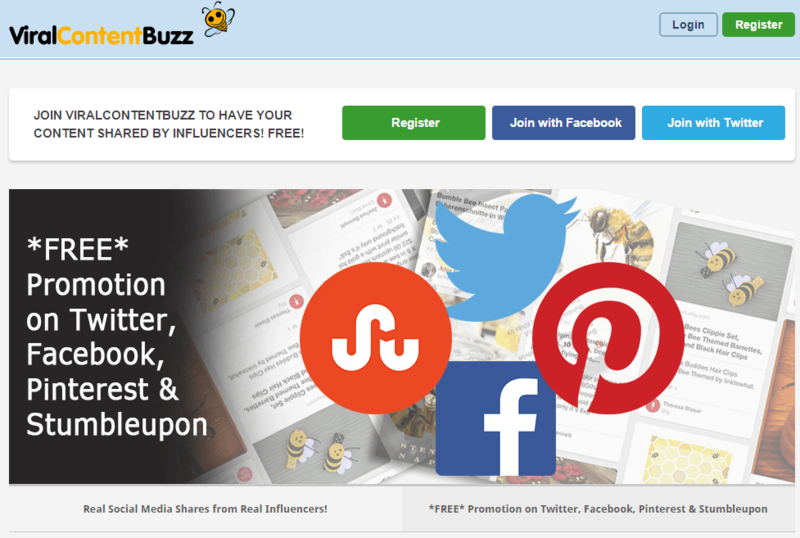 We love to have you at both MyBlogU and Viral Content Buzz! I love to be part of awesome communities like MyBlogU and ViralContentBuzz. I really appreciate your visit and comment here. In my experience, the first and most important thing about Viral Content Buzz is that IT WORKS! When you need quick attention directed to an online article, Viral Content Buzz is one powerful tool. together with the influencers using this platform. In a few words, as you stated, it works! This is great post that you’ve shared to us thanks for clear cut/step by step explanation from starting of account till post go viral. I’ve a question, our post goes viral, only we have enough followers/subscribers. Or is there some thing like no. of people to follow in return they follow and share your post ? depends on the amount of credits you will assign to each of your project. you are going to earn 2 credits for each post of other members you share on ViralContentBuzz. Great review my friend. I have heard about VCB before but I was not very familiar with it at all. You are so correct that once we write that awesome content it should be our goal to get that content shared to as many people as possible. That can be difficult if we do not use the correct platforms. It is hard to believe such a powerful platform is free but I am very glad that it is. One of the biggest things I like about VCB is that their staff manually review the content. This does not happen on many other platforms. This will ensure that the content you are sharing is quality, which is a good thing. Thank you for sharing and Have a Merry Christmas my friend! Isn’t a good thing that ViralContentBuzz team are approving manually the content submitted? I suggest you to use it, my friend. Thanks for the review.. Actually i don’t know about this website..!! Great to hear I introduced you ViralContentBuzz, Akash. You should use it, it’s fantastic for marketing and for increasing your audience. great to know I introduced you this great website! ViralContentBuzz can help you increase your social media audience, while getting more traffic to your content. I suggest you to give it a try. glad to hear you are PRO marketer over there. Hope we find a way to continue collaborating together. I keep dipping in and out of VCB from time to time. But I find it slow. I prefer to check each post first before I share. But as you say, hopefully, the quality is already in place, so I guess I should try it again, and just select the titles that I think sound suitable. it may be slow, but I see more quality over quantity there. May be you can use it for targeted content. Thanks for commenting here, Nathan. This is a wonderful post. You know I registered in Viral Content Buzz but I have been in and out. I have really taken the time to try out this platform. I think I will check them out as some the features you listed about VCB is quite interesting. Thanks for sharing. I’m glad this post helped you understand better the features and potentialities of ViralContentBuzz. hope you are spending good holidays. Great tutorials Erik, I am impressed by this post. Ive been testing VCB out myself. Ann has done a great job with it and it’s really easy to use and so far, the traffic is good. Ann did an amazing job creating such an awesome platform. Content is great and I see many influencers among ViralContentBuzz users. Thanks for leaving your views. I guess it really depends on the quality of your posts (must be in English). You always seems to post just the right thing at the right time. Your review is truly helpful and it gives practical advice. I have never heard of this site before so I abbreviate this post because we could never have too many ways to help promote our work. I’m heading right over to set up my account, thanks! You’ll like Viral Content Buzz. Let me know your feedback then. Thanks a lot to share such a great post. Before this I tried justretweet but dont know why they dont approve my tweet and share this. Now after reading your post, I use this one. Its my very good experience with VCB. It helps me a lot to make my post viral on stumbleupon and twitter. And I also see some improvement in followers as well. I will recommend it for everyone. Thanks for sharing your experience here! It’s all about using the right tools! One way to get traffic to your website is to create what’s called “viral” content. Viral marketing is when you create something; whether this be an eBook, a list of tips, a video, or just about anything else you can think of that you could do online that gets a lot of people buzzing and talking about. When done effectively, the content you’ve created will get passed around from person to person very quickly and you’d be surprised at how many website visitors you’ll get because of that viral content. Your post is unique and awesome. I”ve been using Viral Content Buzz since 2013, and it’s pretty cool..
One of my goals this year is to pump up the volume by using paid advertising for my blog posts, so I was wondering if using a pro feature was worth it.. What do you think? I would love to have your feedback if you have any. Thanks for sharing this, and happy new year! As per becoming PRO, among the features, it gives you free credits renewed each month and access to PRO forum. But the best thing is getting RSS automatic submission. This means you don’t have to worry to submit your new blog posts and lets you save some time. Thanks for your visit, and happy new year you too! Hi Erik, hope you’re well! I tend to lurk around your site and read many of your posts from time to time. Keep up the amazing work. I have a question and was wondering what you think about this: I have read a few horror stories of StumbleUpon banning users (or their websites) for using exchange systems similar to this. I’m not quite sure if this should technically be called an exchange system,but it DOES sound like one. 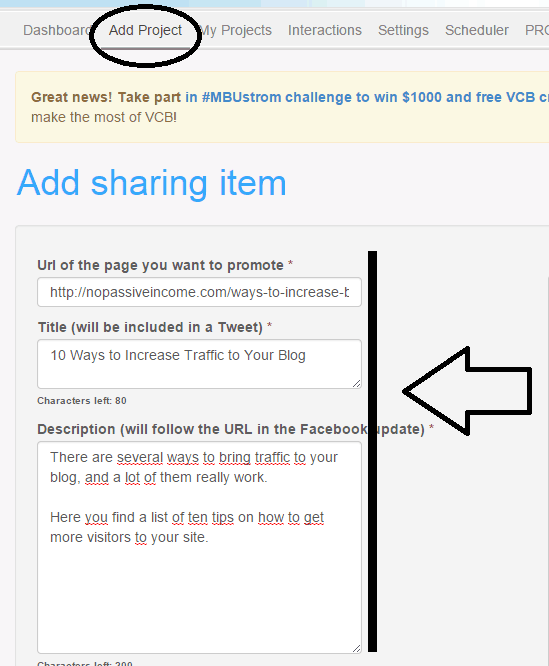 So, do you tend to enable your StumbleUpon account with this system? And if so, do you get traffic from them even to this day? I would be willing to start out with Twitter, maybe, and then gradually proceed with caution. So, if you have any safety tips (or if you have personally seen bad press from this tactic), that would be great! everything is great, I hope the same for you! I’m not sure if you meant this, but are you referring to traffic exchange sites (not StumbleUpon)? As per StumbleUpon is legit, and people still receive some visits from this social. It’s not like old times, when you could have huge spikes, but still effective. Twitter is my main referral source of traffic on NoPassiveIncome. Use it in combination with Triberr or JustRetweet to exponentially increase your audience! Hope it helps, let me know! Yeah, I simply meant to ask if you think the StumbleUpon staff are okay with things like Content Buzz (in your opinion), since they have previously banned some users for using systems that have a “favor-exchanging” behavior (you share my stuff and i share yours). In any case, I’ll proceed with caution and explore Content Buzz slowly. Thanks so much for letting us know about its existence! 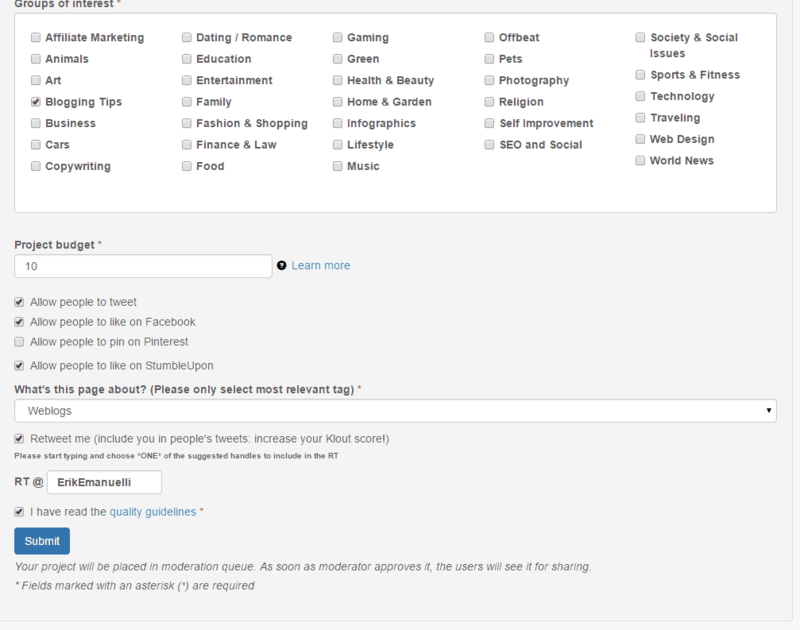 Well, I have not read any TOS of Stumbleupon, but I think that the guys at ViralContentBuzz know what they are doing. I mean, if they have set up that system, it should work safely, at common sense. After reading this Tutorial,I will try it and get a awesome response.